Cats stalk quietly and wolves prey in packs but why is the behemoth of a BJP getting paranoid over antsy Aam Admi Party (AAP) and barking up all manner of trees? Quite simply, because it’s iron clasp grip on Gujarat is slipping and a queasy national party leadership is stuck for options to reverse the trend. AAP, analysts say, is set to make impressive gains in Punjab and Goa and this will majorly impact election results in Gujarat which goes to polls in the last quarter of 2017. A mere foot-in-the door is all that AAP needs in the prime minister’s home state to make ants crawl up the pants of the NDA government in the 2019 general elections. A panic stricken Goliath is even mulling the ultimate option of early elections in Gujarat along with UP and Punjab, more to stretch AAP to oblivion than to run the Congress out of reckoning. While BJP president Amit Shah has asked the state party leadership to get into poll mode post haste, the Congress, marinated by Modi through three state Assembly elections, still remains a pregnant hippopotamus in languorous recline, notwithstanding it’s significant gains in the December 2015 local self government elections. Grasping the opening, AAP has been sprightlier with Kejriwal making ‘surgical’ strikes in Gujarat to capitalize on the lapses of the BJP government before moving back to the safety of his stronghold. Stung to the quick, the administration resorts to reprisals against the beneficiaries which completes the vicious circle that helps Kejriwal consolidate on his gains.AAP has truly become the bugbear of the BJP. 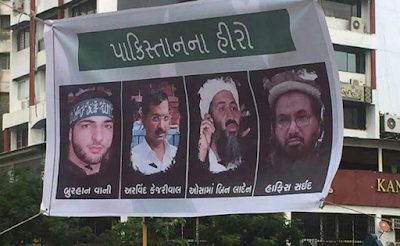 Even before he stepped onto the Gujarat soil on a three day visit ending October 16, 2016, posters appeared in the name of ‘unheard’ organizations equating him with terrorists like Osama bin Laden, Hafiz Saeed and the Hizbul Mujahideen's Burhan Wani. Put up around Unjha and Mehsana towns in North Gujarat and Surat in the south, these termed him as "Hero of Pakistan” and a “traitor” to India. Interestingly, these pasted posts made their appearance only in the citadels of Patidar rebellion against the BJP led Gujarat government just the night before Kejriwal was to meet the family members of those killed during the pro-reservation agitation by the upper caste Patels. Ever since Kejriwal came out in support of the Patidar and Dalit stirs in the state, he has earned the ire of the BJP which rules Gujarat but this has only heightened his appeal amongst this class. AAP's Gujarat convenor Gulab Singh Yadav has been categorical putting the blame squarely at the doorsteps of BJP chief Amit Shah. “Just the presence of our leader rattles this government”, he said. He has a point. Hours before the all important Surat rally of the party,the Delhi police turned up to arrest him, making Yadav the fourteenth Delhi AAP legislator to be picked up by the cops. Alas, too late for the Surat rally was a roaring success. Permission for the rally was not easy. The Surat police sat placid on the request made in August for a rally in mid-october and budged only after the High Court intervened with a show cause notice to the state government. Earlier in July, the South Gujarat University withdrew permission for a similar Kejriwal function and the trade body which had extended the invitation was forced to back down. The authorities, however, had no problems granting permission for rallies in Surat by Shah, union minister Smriti Irani and even Congress legislature party leader Shankersinh Vaghela. Gujarat BJP spokesperson Bharat Pandya denies any role of his party though the sequence of events do not bear this out. The targeting of Kejriwal has been vicious in Gujarat though less than after he worsted the BJP to an auto-load in Delhi, an upgraded municipal corporation ‘packaged’ as a state government. And yet the might of the Centre runs in awe slapping cases on legislator after AAP legislator,14 of them, by last count. It is true to a pattern for those who have watched a decade and a quarter of Modi rule in Gujarat. In fact an extension. All the Gujarat police officers who were behind bars under court ordered investigations in numerous fake encounter cases, including charge-sheeted ones, are back in plum posts while those who slogged to bring them to book are fighting for their lives. Only last week Tarun Barot who was arrested in connection with the Ishrat Jahan and Sadiq Jamal encounter cases has been reinstated post-retirement on a one year contract as DSP, Railways. In contrast, Inspector General of Police, Satish Verma who assisted investigations under High Court orders stands shunted to the North-East and is locked in a battle to retain government accommodation for his family which is mandated under the rules. Instances abound. As things stand, the BJP, it’s novice chief minister Vijay Rupani and state party chief Jitu Vaghani are all at sea in their new charges. Rupani ,a Shah appointee, like Congressmen of yore, keeps looking Delhi-wards for both inspiration and orders, and Vaghani, a Patel has problems gaining the support of his community, let alone run the party. Political interns fronting for Shah are poorly placed, stepping into Modi’s shoes in Gujarat, let alone helming the party into elections. Even Shah with all his muscle and Modi support cut a sorry figure when his show of strength in Surat in September was sabotaged by the agitating Patels who have been boycotting government functions and ministers with considerable success. Shah would find the going tough if he himself takes over in Gujarat! Survey the scenario. Patidars who comprise 15 per cent voters have been on the warpath since July 15, 2015 demanding reservation and their leader Hardik Patel though incarcerated out of Gujarat under court orders is now a force to be reckoned with. Close on their heels come the OBC who are nearly 45 per cent of the population and are opposing any possible cut in their quota. Led by Alpesh Thakore they have chosen a more sanitized way of demonstrating their clout by targeting bootleggers and the cops who make merry through liquor prohibition-a huge industry in Gujarat. Then follow the warring Dalits, comprising 7 per cent, who have already scalped a chief minister (Anandiben Patel) and are still on the job headhunting. All in all, not a re-assuring experience for the BJP to find 82 per cent of the state’s population up in arms against the government and Kejriwal wading into the turmoil, as aggressive as Modi used to be attacking the centre during his Gujarat days!